A Memorial Service for friends and relatives will be held at MISSION SAN ANTONIO in Jolon, CA ( near King City) August 17th at 11:00 a.m. Reception to follow. Dusty Miller is gone. That just doesn’t seem possible. A world without his joy, his grin, his big heart…what a strange place it will be. 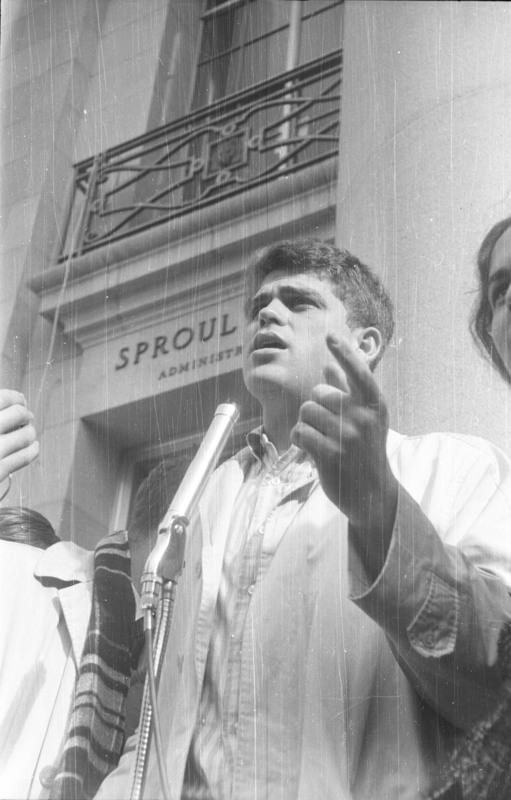 We, the members of the Free Speech Movement Archives board would like to share our love of Dusty with his family and friends. We’d like to tell you a bit about a man you may not have known, one who fifty years ago was with us as a brother, a friend, a leader and an inspiration. We knew him as Dusty, and he was a force of nature. 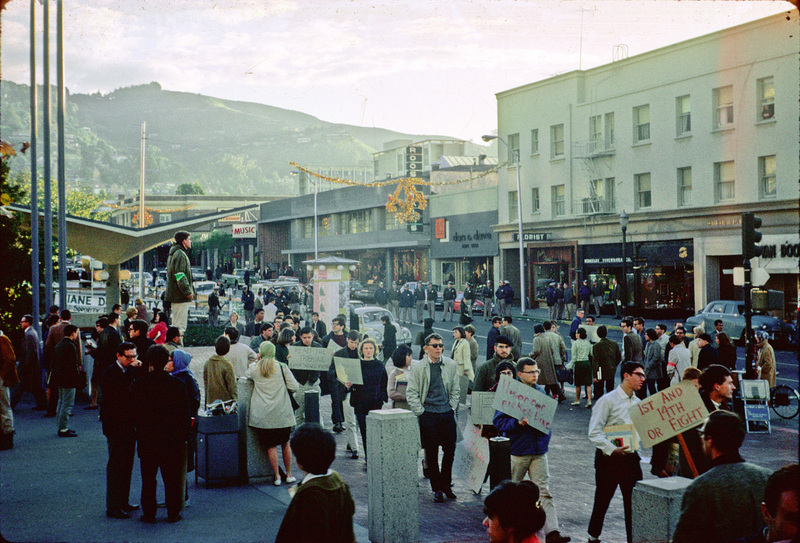 In the fall of 1964 the University of California administration decided that students were not entitled to the same rights as other citizens to conduct political activity. it sparked the first huge student protests of our generation. Jack Weinberg was arrested and put in a police car, for sitting at a card table to raise money for the Civil Rights Movement. Hundreds of us objected by sitting all around the car and holding it for the next 32 hours. A procession of people climbed to the roof of the car, carefully removing their shoes so as not to damage it, and spoke to the crowd. Many who did so spoke eloquently. Many were from an East Coast, intellectual, and political culture, and they were uplifting, thought provoking, brilliant and of course, at times a little boring or self consumed. Then a big guy got up on the car, in a tan jacket, his head covered with sandy curls, and spoke to us. He didn’t speak in the voice of academia. He spoke in the voice of the Southern California beach, in the voice of all of us who didn’t have it all figured out. He spoke from the heart, from the soles of his feet, from his soul. He was angry, he was funny, he poked fun at the pomposities of the administrators and all the elders who had been telling us to be good children and shut up. The crowd loved him. He spoke, more clearly than anyone else, for the ordinary student who might not have had a sophisticated analysis, but who was tired of being pushed around by an older generation who could look calmly on segregation, nuclear weapons, and Joe McCarthy and tell us to be patient. 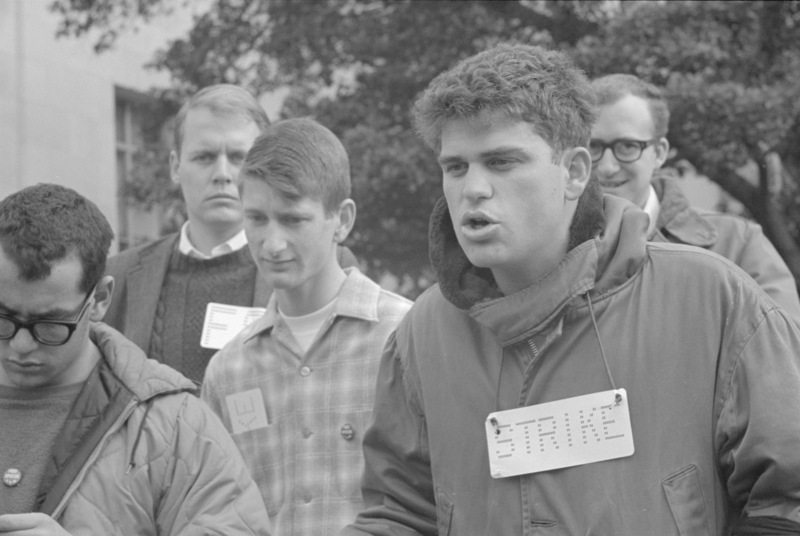 Dusty was promptly put on the steering committee of the newly-formed FSM, recognized as the “leader” of the independents for free speech, that group of students who were part of no organization but who were as much in the fight as the kids in SNCC, CORE, the various kinds of socialists or the Young Republicans. But Dusty was not real big into going to meetings. He had no ambitions to be a LEADER, no agenda to push, except democracy, and drifted away from the center of power. One history of the FSM dismisses him as a “light weight.” That missed the point, completely. Dusty went with his strength, reaching people, and organized and produced the FSM Christmas Carols record. It spoke to more students, and their families and friends, than any essay or most orations. Dusty was the irreplaceable man. We won because we reached far beyond the “politicals” on campus to convince the bulk of the student body and faculty of the justice of our cause, and why it was something they needed to actively support. Dusty was one of the keys to that appeal. We couldn’t have won it without you, brother. Farewell, Dusty. If you are right, and are resting in the arms of God, we know you are looking down and smiling; blushing when people say grand things about you, getting just a little ticked off if someone calls you a hero or leader. And probably sipping a very good beverage. Salud! Jack Radey, Lee Felsenstein, Anita Medal, Gar Smith, Margot Adler, Bettina Aptheker, Robby Cohen, Susan Druding, Barbara Garson, Jackie Goldberg, Lynne Hollander Savio, Barbara Stack, for the FSM-Archives. If Mario was the soul, Dusty was, as much as any individual could be, the heart. October 1, 1964: Dusty speaks from the police car. Tom Kuykendall photo R115F20. 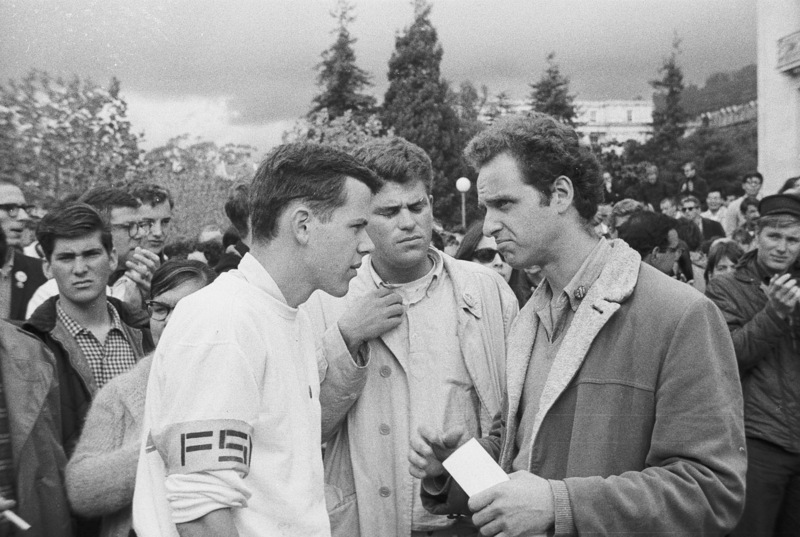 November 4, 1964: Syd Stapleton, Dusty Miller, and Mario Savio. Steven Marcus photo. 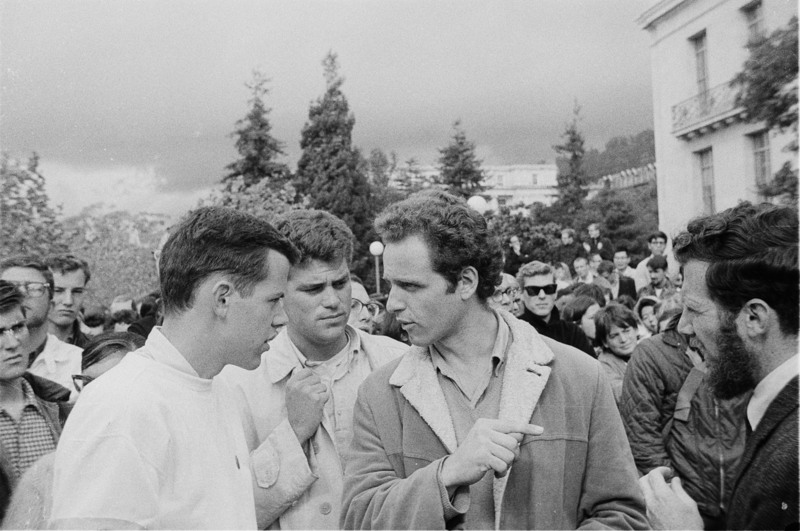 November 4, 1964: Syd Stapleton, Dusty Miller, Mario Savio and Steve Weissman. Steven Marcus photo. 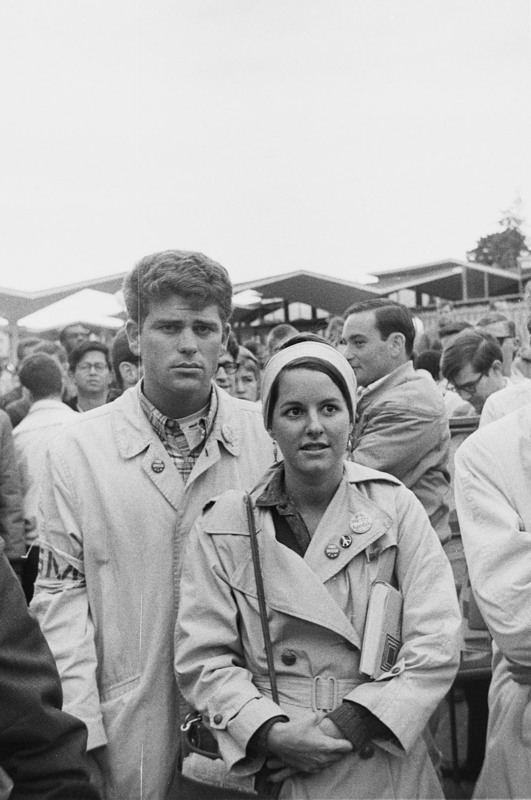 November 9, 1964:Dusty Miller wearing FSM armband and unidentified woman at rally. Steven Marcus photo. Dusty Miller and other students with STRIKE and FSM cards. Helen Nestor photo. I have developed some SEVERE health problem. I have kidney cancer which has metastasized into my spine and lungs and I am not sure where else. Bottom line is my doctors don't expect me to last more than a year. My two goals are to attend in reasonable health the Fall 2014 50th Anniversary FSM reunion, and on December 30th, 2017 to celebrate with my wife Jane Nicols Miller our 50th wedding anniversary. We will see how that all plays out. I have few secrets. I consider the FSM my military unit from the culture wars of the previous century. Y'all are my comrades. I don't see us as perfect or mistake free, but we did the best we could and gave it our all. I never thought I would die before my less healthy friends, relatives, and neighbors, but now it looks like I am in a race to the finish line. Wanna make God laugh? Tell Him your plans. I've had a great life: fine wife, more good friends than anyone could deserve, more fine wine and good food than anyone should be allowed; I've had my share; can't complain. Today I am a deacon in the Catholic Church. We are taught that even suffering can have a value. I don't seek suffering. In fact, I am taking powerful medicines to avoid pain, but there is some, none-the-less. I offer this up. I love you all. Thank you for being my friends. I hope to see you all one more time. We have left our finca (small homestead) in Monterey County and now live in SAN Marcos, CA, where I am having palliative care for my illness. If you wish to contact me please do so through email as it is a lot easier for me to answer than snail mail. Don't cry for me, amigas; I live in a beautiful home surrounded by loving family and friends. Wonderful food, all the fine wine I can drink, cable TV, FM radio, good nearby library, support from my church and Franciscan brothers. In a few days I will bring down my pedal & sail boat; dunno if I have the strength to sail or pedal. Right now I am working on building an ocean view vacation cabin for my family to enjoy when I am gone. I sure hope I can last long enough for one more reunion with y'all. I have learned the value and power of visiting the sick and the imprisoned, and also the good effect a card or note from friends has on one's outlook that day. Before my current illness I thought such things were unimportant.